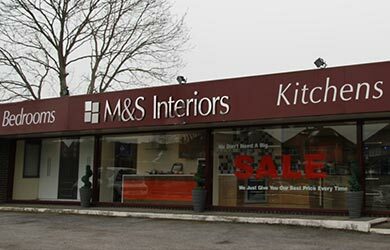 M&S Interiors are a family-run business that supply, design and fit kitchens and bedrooms in the East Midlands. We provide a high-quality, affordable service that is designed with you in mind, and our mission is simple - we aren't happy until you are! M & S Interiors were established over 25 years ago and have been supplying, designing and fitting kitchens and bedrooms in the Nottingham area ever since. As a result, we have developed strong connections with suppliers, and M and S Interiors have a considerably lower mark-up price than most big, high-street manufacturers and stores. With our flagship showroom at Watnall. Our representatives are able to assist with your queries and advise on the products and services offered. we cater for all budgets? At M & S Interiors, we believe that if you're not satisfied, then we're not satisfied - it really is that simple! We offer a range of different services, designed with you in mind; whether this be the management of your dream kitchen, bedroom or makeover project, or just simply the supply of the kitchen for you to fit. We specialise in the design, installation and aftercare of your dream kitchen, bedroom or makeover. Please feel free to browse our website and, if there's anything that you need to clarify or you need to ask any questions, please do not hesitate to get in touch with us via our Contact us page and we will be happy to help assist you.